Left to right, top to bottom: First Place, Dave Seals, The Bridge; Second Place, Scott Wheaton, Side by Side; Third Place, Dave Seals, A Foggy Day; Honorable Mention: Steve Aker, Three in One; David Rossi, Abstract Eclipse; Dennis Loughlin, Memorial to a Maid; Scott Wheaton, Osprey. Left to right, top to bottom: Third place, Anne Harlan, Study in Black and White; Honorable Mention: Don Chillemi, Gray Spirit; Scott Wheaton, Stretching Up; John Oesterling, Waiting to be Loaded; Gary Levy, Zebra Pair; Anne Harlan, Patterns. Third Place, Scott Wheaton, Red White and Blue; Honorable Mention, Dennis Loughlin, Early Morning Reflections. 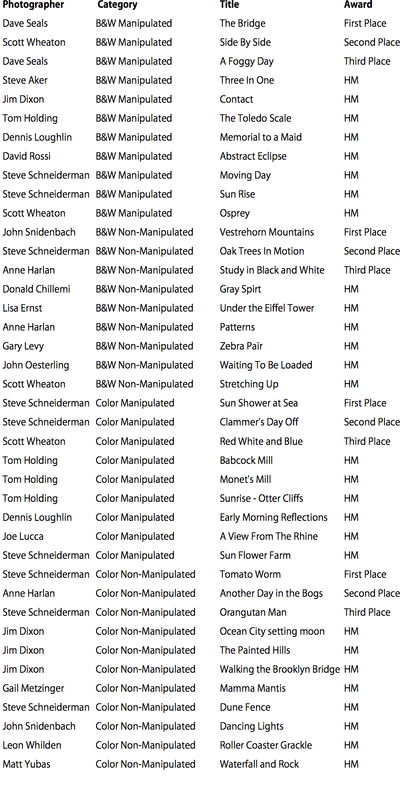 Second Place, Anne Harlan, Another Day in the Bogs; Honorable Mention: Gail Metzinger, Mama Mantis; John Snidenbach, Dancing Lights; Matt Yubas, Waterfall and Rock.